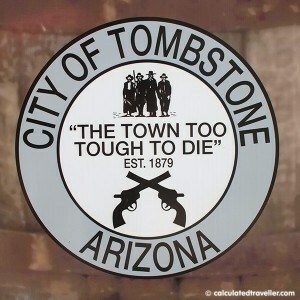 Tombstone, Arizona - It's A-O.K. 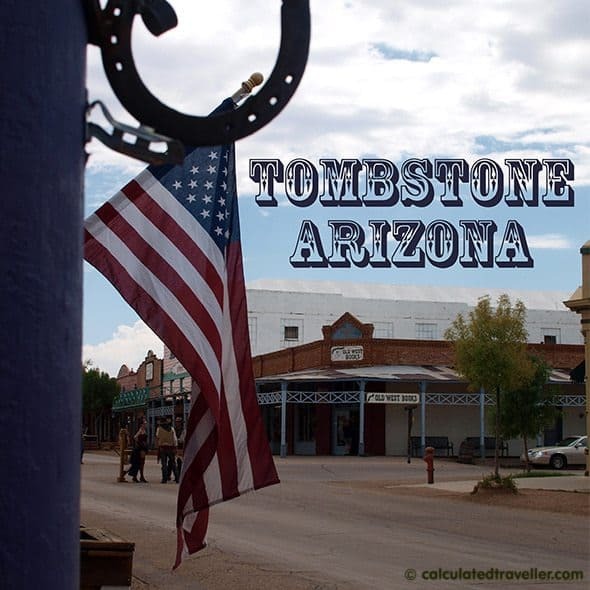 Home » Adventures » Culture » Tombstone, Arizona – It’s A-O.K. It’s kitschy, it’s touristy and everyone is dressed in costume as either Wyatt Earp, Doc Holliday, a saloon girl or one of the Clanton/McLaury Gang….but an afternoon spent in Tombstone, Arizona is still full of real history and fun. I didn’t know much about Tombstone other than what I saw in the various Hollywood movies of the famous gunfight at the O.K Corral. But I did know that it was a real historic event and that there would be cowboys so, we hit the road early from Phoenix for the 4-hour drive. 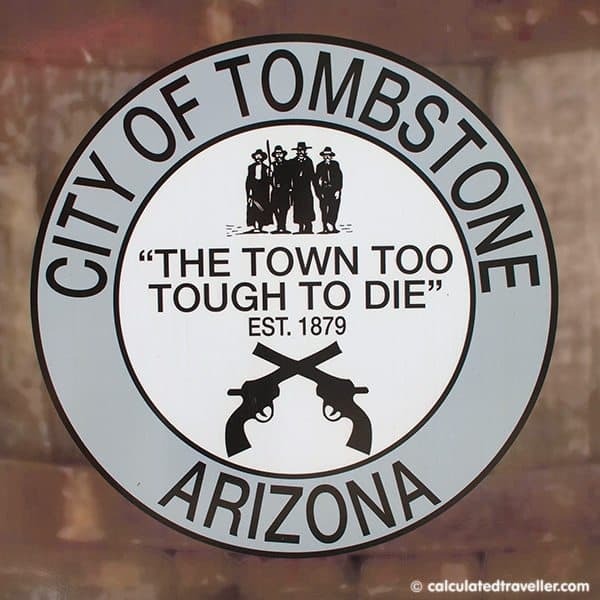 This is a major slogan for this town and is seen everywhere – brochures, signs, you even see it on the side of the city garbage cans (pictured here) and the truth is that the city of Tombstone was nearly destroyed by 2 major fires and nearly became a ghost town in the late 1920’s. Now, the town is pure tourism with some history thrown in here and there. Stage Coach rides, mine tours, saloons and antique shops to stroll and look through, but the one thing you MUST do is see a gunfight! Once you ride into town (sorry, I couldn’t resist wink) you will be instantly approached by all sorts of cowboys with a gentlemanly tilt of the hat and a kindly “ma’am, are you interested in seeing a gunfight today?” – It’s quaint and quite flattering as you walk down the street and I must admit – I may have blushed a few times. A gunfight is a must and there are about 4 or 5 to choose from. Some are based on history and some are just comedic and plain fun. We chose the historic O.K. Corral version which includes 5 exhibits, a 30-minute reenactment of the gunfight (on a stage next to the real site), a multimedia “historama” and a souvenir newspaper of the 1881 actual gunfight reports. A deal at just $10 each. Speaking of the historama, at 25 minutes long this “multimedia” history of the town is a bit like going back in time to the 1960’s when multimedia meant multiple forms of media. It looks like a giant mound on a giant turntable all covered in decades of dust and I’m sure in 1960 it was quite the spectacle. Now, it’s all creaking, thumps, flashing lights and mechanical wires as each scene in the story is revealed with each 1/4 turn of the turntable all narrated by Actor Vincent Price. Keep in mind the price you paid because the historama did make me giggle a bit when it started but it did leave me wondering in the end at how they actually designed it and made each little piece move! All in all, it was great fun and a good day trip from Phoenix. Don’t forget to visit Boothill Graveyard on your way out-of-town – it’s also a must see. If you have extra time and are up for an adventure try a ghost town driving tour. – Boothill Graveyard article is here. – Ghost town driving tour article is here. 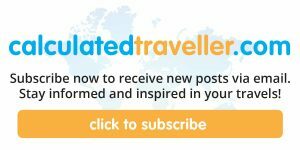 – Our Five Favourite Places to See in Arizona. We had no trouble finding free parking on the side streets but there are a number of parking lots in town. Public restroom are located in the Tombstone City park next to the O.K. Corral. We packed a picnic and ate in the park but there are plenty of reasonably priced restaurants on the main street. Each museum/attraction throughout town has a separate entrance fee. 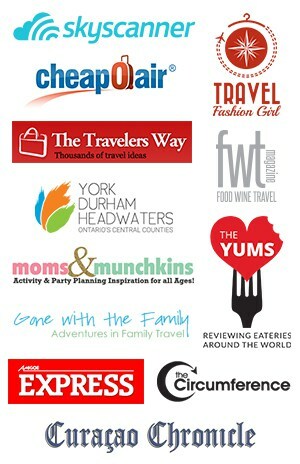 We chose to visit only the one attraction but keep this in mind as your costs could start adding up. We did get stopped by customs officers on the road out of Tombstone. As the city is very close to the US/Mexico border, they do checks periodically to make sure that you are legally permitted to be in the country. We did not have our passports with us and were told by the officer that we should have them with us at all times while in the USA. Here’s a video showing some highlights of our afternoon. Have you been to Tombstone or a western themed town before? Tombstone is definitely a fun day trip from Phoenix! Of course, we just had to watch the movie Tombstone when we got home from the town of Tombstone. We did the exact same thing!! Especially, since we saw Kurt Russell’s actual saddle on display at the O.K. Corral. Thanks Jennifer!